Defiant crowds have spent the night on the streets of Sudan's capital, Khartoum, ignoring a curfew declared by the military. The curfew, in force from 22:00 local time (20:00 GMT) to 04:00, was declared for the "safety" of citizens, state media said. The armed forces and the security council would carry out their "duty to uphold peace and security and protect citizens' livelihoods", it said. Thousands of people were still camped outside military headquarters on Friday and the crowd was reportedly growing. Thursday's mood of celebration after news of Mr Bashir's arrest evaporated when organisers called for the mass sit-in to continue. 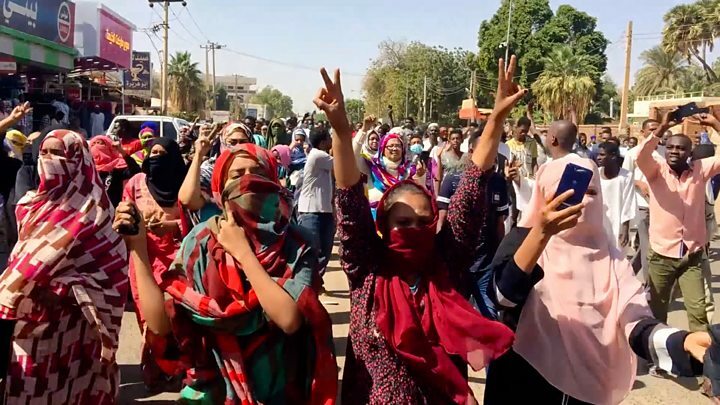 "This is a continuation of the same regime," said Sara Abdeljalil of the Sudanese Professionals' Association (SPA). "So what we need to do is to continue the fight and the peaceful resistance." 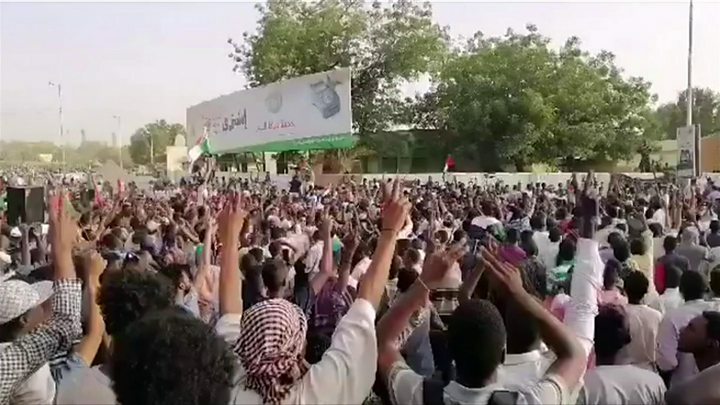 An SPA statement said that "those who destroyed the country and killed the people are seeking to steal every drop of blood and sweat that the Sudanese people poured in their revolution that shook the throne of tyranny". The SPA has previously said that any transitional administration must not include anyone from the "tyrannical regime". Crowds waved flags and chanted "Fall, again!" - refashioning their previous anti-Bashir slogan of "Fall, that's all!". State TV and radio interrupted programming and Defence Minister Awad Ibn Auf announced "the toppling of the regime". He said Mr Bashir was being held "in a secure place" but did not give details. Mr Ibn Auf said the country had been suffering from "poor management, corruption, and an absence of justice" and he apologised "for the killing and violence that took place". Who is the military council's leader? Before the coup, Mr Ibn Auf was Mr Bashir's first vice-president and defence minister, and was regarded as being well placed to succeed him. 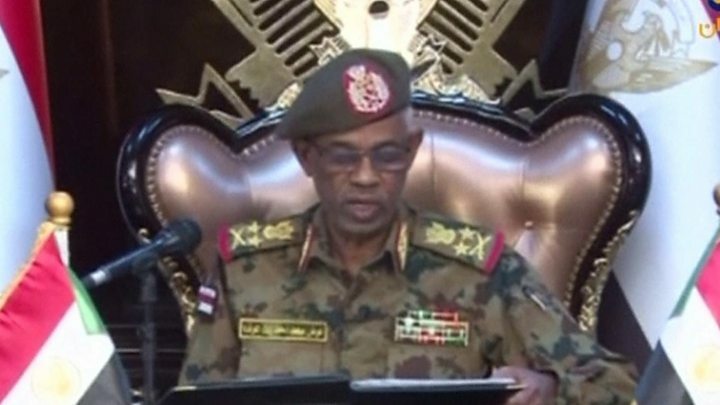 During the Darfur conflict at the beginning of the century, he was head of military intelligence and the US imposed sanctions on him in 2007 in relation to his alleged support of the Janjaweed militia blamed for atrocities there. The fear will be that they have no such intention. The security elite has calculated that removing Omar al-Bashir and imposing a curfew will buy them time and end the protests. If so, this represents a serious miscalculation. The SPA and other civil society groups have made it clear they won't accept a cosmetic change. They have the numbers and are highly organised. It is not yet clear what will happen to the 75-year-old, who is now in custody. He is the subject of two international arrest warrants issued by the International Criminal Court (ICC), which accuses him of organising war crimes and crimes against humanity in Darfur between 2003 and 2008. There are, according to the ICC, "reasonable grounds" to believe that he "acted with specific intent to destroy in part the Fur, Masalit and Zaghawa ethnic groups". Mr Bashir's rule was marked by civil war. A conflict with the south of the country ended in 2005 and South Sudan became independent in 2011. UN Secretary-General António Guterres appealed for "calm and utmost restraint by all" and urged a transition that would meet the "democratic aspirations" of the people. The UN Security Council is to discuss the situation in a closed-door meeting on Friday. UK Foreign Secretary Jeremy Hunt said that a two-year military council was "not the answer" and called for a "swift move to an inclusive, representative, civilian leadership".